Do you live and breathe video games? Come and learn all the key aspects of games development, game programming and game design from lecturers with more than 20 years’ experience in the industry! This award-winning, innovative course will give you the sought-after practical experience of working creatively and collaboratively at the forefront of tech advances. Real-world application of your skills is essential – and you’ll have the opportunity to work with external clients and game publishers such as Bethesda and Ubisoft. 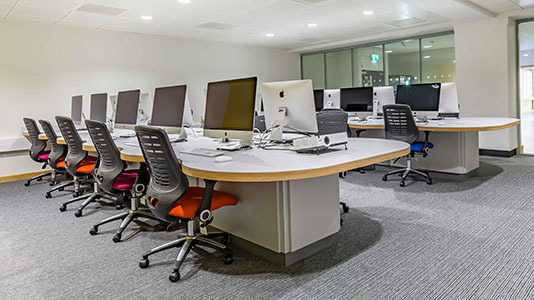 LSBU is a centre of excellence for virtual and augmented reality games research in London and also offers development experience in pervasive gaming. Why study Games at LSBU? Top 5 for graduate prospects amongst London competitors in Art and Design (Complete University Guide 2019). Breaking boundaries: The course is a centre of excellence for virtual and augmented reality games research in London and also offers development experience in pervasive gaming. Taught by professionals working in the games industry the course content anticipates and goes beyond industry trends in order that you graduate with cutting edge skills. Take advantage of our Industry links, such as working on international game development projects with organisations like UNICEF. Our multi-million pound Elephant Studios: with facilities including games design centre, digital design suites, and industry-ready film and photographic studios. Work experience: Take advantage of volunteering opportunities with the game publishers Ubisoft and Bethesda – and our connections with Eurogamer, BAFTA, Sony, Eidos, Ubisoft, Bethesda, Nintendo, and video game magazine publishing houses including Future and Imagine. Top for graduate prospects amongst London competitors in Art & Design (Sunday Times 2019). This course was previously called Game Cultures. 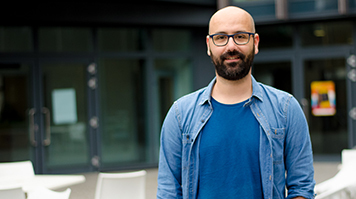 BA/BSc Game Design and Development student Otavio Pliger shares how his course has encouraged him to pursue his dream career in the gaming industry. On this course you’ll learn the essential skills required to work in the games industry, as well as developing your creativity under the guidance of passionate games industry experts. You’ll learn the technical side of making games and about the gaming industry too – acquiring the creative and organisational skills specific to game production and leadership roles. You can expect to create games for a wide range of gaming platforms: computer games, arcade games, gaming consoles, mobile games and online multi-player gaming. We’ll cover: game and level design, life drawing and anatomy, character design, animation, sound design, scriptwriting, 3d modelling, motion capture – all culminating in a major independent project. Understanding the principles and practice of game design is a crucial first step in enabling you to build innovative games. In 2D Game Design you'll learn the key elements involved in videogame production by creating a digital game. As a group, you'll develop a game concept and then, in specialist production teams designed around key game industry roles (e.g. producer, artist, designer, sound engineer, programmer) and with an emphasis on QA, you'll realise their game vision. We'll familiarise you with professional skills crucial to the game development process: managing the game asset pipeline, strategies for meeting deadlines, game development project management techniques and, of course, team work. Assessment: group assessment of a game (50%), and an individual assessment of design/programming element taking the form of a level of the game, containing both play element and cut sequence (50%). In order to engage effectively in the process of videogame design and development, you need to understand how art and sound perform together as the fundamental building blocks of digital play spaces. In this module you'll learn design techniques and processes integral to art and sound design in videogames. Specifically, you'll learn to observe, record, express and represent both objects and sounds, and, in doing so, explore the interrelationship of the visual and audio in the context of videogame development. The skills you learn in this module will prove invaluable for the complementary 2D Game Design module, whilst also providing a bedrock for production work you take on in subsequent modules. Assessment: Character design—art: oral presentation supported by sketchbook (30%), Character design—sound: oral presentation supported by digital sound files organised in student’s sound database (30%) and Cartoon strip/ storyboard cutscene, with an original soundtrack (30 seconds to 1 min) supporting character design. The soundtrack needs to incorporate voice, foley, soundFX and ambient sounds (40%). Memory Games traces the rich cultural heritage of videogames. In this module we discuss pivotal events in videogame history and, along the way, pay homage to the designers, developers and players who have made the industry what it is today. During this module you'll take a personal journey, reflecting on the games you play, see why you began to play them and explore what it is about the games you play that makes you continue playing them. Central to this voyage of discovery will be recognising the crucial role the past plays in shaping the games they are going to create in the future. Assessment: 1,500-word videogame essay (75%), and an in-class exam (25%). 3D Modelling introduces the process of creating models in 3D. You'll explore the connections between 2D art and 3D modelling, examining issues such as: perspective, texturing, rendering and lighting. Skills acquired in the 3D Modelling module will prove invaluable for your second and third year production work. Assessment: 3D environment model(s), supported by accompanying workflow post-mortem (100%). The game industry is one of the most exciting and compelling creative industries to work in, but it is also one of the toughest. Not only is it hard for a young professional to get his or her foot in the door, but rapid technological developments and a lack of open exchange of information due to fierce competition between game companies, make it hard to keep ahead of the game. Industry and professional practice is a module designed to tackle both of these challenges. Through a series of innovative master classes you'll gain insight and knowledge from a diverse group of game industry experts. At the same time, you'll learn the professional codes and conventions of the game industry and develop the professional skills they need to get a job in the game industry. Assessment: game pitch (40%) and CV and portfolio (60%). A lecture series with accompanying seminars on the topic of The Creative Industries, and visits to TechCity UK and other centres of artistic practice. Assessment: a 1,500-word essay (100%). You'll be given a small range of suggested topics, but you'll also be able to pick a topic of your own choosing, assisted by your seminar group leader. All video games tell a story, even Space Invaders. In the twelve-week module Story Design, you'll learn the fundamentals of good writing regardless of intended medium, and then focus more closely on video game specific mechanics, with an emphasis on practical knowledge - how to work with a writer, what formats you need to understand and how to get a job in the first place. We'll strike a balance between the cinematic, high-production values of AAA fare and the more experimental, cutting-edge realm of bedroom development. Even if you have no intention of writing professionally, knowledge of dramatic interactive techniques can still be a fundamental principle of work in production, art and design, and can help you to work with writers in the future. Assessment: a 1,000-word project proposal (25%), and script extracts for beginning and end cut scenes together with the step outline diagram (75%). Character Modelling and Animation extends the core art concepts, skills and techniques covered in the first year. Here you'll embark on an essential game art task: creating an animated story. You'll learn advanced character modelling techniques and get to grips with the animation pipeline. You'll attend bi-weekly observational and life drawing sessions to support you develop of traditional drawing skills—an essential requirement for game artists. Assessment: portfolio (100%). Stepping up a gear, you will enhance your design skills by creating a game level in 3D using an industry-recognised game engine. The module not only provides you with the practical skills required to effectively create 3D levels, but introduces two key industry professional skills: pitching and writing design documentation. Prior to beginning level production you'll first “pitch” the 3D game your levels will be found in. Then, once green lighted, you'll produce effective written documentation to refer to whilst making your levels. You'll need to think consistently and critically about ideas of play and playing. Assessment: Part 1 - level design document, supported by a 1,000-word game pitch explaining the 3D level (25%); and Part 2 - a 3D level supported by development diary and video walk-through (75%). Re:Creation marks the halfway point of your degree. Crucially, the Re:Creation module explores the requirements and expectations of two key level 6 modules: the 10,000 word dissertation and the Advanced Game Project. To this effect, you'll identify a potential area of interest for the dissertation, synthesize the various kinds of theory that you have encountered so far on the course and, conduct a literature review in their area of interest. This literature review will provide you with the necessary knowledge required to hone your dissertation ideas and prepare your dissertation proposal. The module also requires you to take an in-depth look at your own professional practice, while planning for the future. You'll prepare for year three's Advanced Game Project module by undertaking one of the most challenging formal communication tasks in the game industry: pitching a game concept. Assessment: 4,500 word dissertation proposal (50%), and a Game Project Pitch and accompanying panel interview (50%). Every game requires coding. In this module you'll explore key concepts in programming and learn how to apply them to their own game project. Throughout the module sessions you will not only develop your understanding of the fundamentals of game programming, but also further develop your understanding of the game production processes you learned in year 1. You'll also be expected to schedule and accurately track game programming tasks. The module will not only provide you with a conceptual understanding of the programming of games, but will provide you with key project planning and management skills that you can then apply to next year's Advanced Game Project work. Assessment: game programming task (25%) , and a game project (75%). One of the advantages of studying in the School of Arts and Creative Industries is that students have access to all of the student talent enrolled at the school. The Collaborative Practice module sees students across multiple creative media disciplines—film, photography, sound design, games, digital design-- working in development teams to create a compelling and marketable project from initial idea to completion. In doing so, you’ll learn how to respond to a brief set by industry and gain essential knowledge about areas related to games. An added bonus is making contacts that you’ll most likely keep for life. Assessment: portfolio 100%. In this module you run a small game development in which you develop the game you pitched in year two. In doing so, you’ll demonstrate your skills as a game designer and producer. Moreover, you’ll further develop your particular game specialism (e.g. artist) by freelancing on other students’ projects. During the module you define a clear brand for your company, plan carefully, protect your assets, manage freelancers and ensure that everything gets done on time. Further, each week you are responsible for demonstrating progress to and documenting feedback from a ‘publisher’ team comprised of industry specialists. Assessment: Pre-production documents including game concept, game requirements and game plan and business documentation (10%), a playable prototype game or game level(s) (15%), a professionally realised game or game level(s), delivered as a playable build (75%). So far, you have learned to design and create games at the desktop. Now we move away from the screen and venture into the real world. In this module, you meet with an industry client who will set a game brief they need to respond to by producing both an innovative accessible game prototype and a unique hardware input device for playing the game they've designed. This module asks you to push the boundaries of play and innovation and to consider the everyday landscape as a limitless playground, whilst meeting the requirements of an external client. Assessment: portfolio assessment 100%. University-level study involves high-level advanced thinking. This is one of the key factors that differentiates university study from general game training courses. In this module, you'll have the opportunity to conduct original research in an area of your passion or interest directly related to your chosen games specialisation. Drawing on the theoretical and practical understanding you will now have at this point in the course, you will explore a specific subject area of your choice under the guidance of an experienced supervisor. The final dissertation is seen as the expression of your intellectual development, but it’s also a good way of demonstrating your ability to a potential employer. Assessment: one 10,000 – 12,000 word dissertation. Modules are assessed through individual and group projects, development work related to industry roles (e.g. 3D model or game script), critiques, oral presentations and pitches, written reports and essays. The UK was estimated to be the 5th largest video game market in 2017, where the country’s 32.4 million gamers will spend $4.2 billion this year (Newzoo). There is also expanding cross-linking between the games and film industry globally. Read more about the UK games industry. This course will set you up for a design-related career in the games industry, or game- related jobs in connected industries such as journalism and PR. Recent graduates have become designers, character and environmental artists, and scriptwriters. Want to hear more about our graduates? 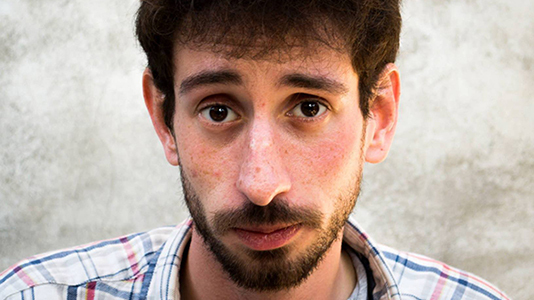 Games alumnus Ari Shirazi shares his story of building a career in the games industry; from being a games-obsessed toddler to a Technical Designer at Sony – and on working on some of the world’s most popular video games. During the course we encourage you to engage with outside professional bodies as a means of increasing your profile and gaining experience. Our students have worked with TT Fusion, Crytek, THQ, Electronic Arts, Buena Vista (Disney's game development arm), Square Enix, Sega and PlayGen. One group of our first-year students was commissioned by the BBC to produce freelance games content. And a group of our second-year students was successfully placed in the highly prestigious Dare to be Digital festival, sponsored by the BBC, Channel Four, Microsoft, Electronic Arts, the Scottish Executive and Rockstar. As one of the most established games courses in the UK, over the past ten years we’ve developed an exceptional international network of contacts. Our lecturers coordinate the London Chapter of the International Game Developers Association (IGDA) and while on the course students’ work on international game development projects with organisations such as UNICEF. The 'out-of-school' perks of being on this course are great, like all the conventions and conferences we are able to attend or volunteer at. There are a lot of opportunities to experience the games industry, hands-on. We are also members of UKIE and TIGA, are part of the prestigious university games consortium BUGS, and the course director was one of the founders of the Digital Games Research Association and the London Game Research Group. Each year students have the opportunity to volunteer with the game publishers Ubisoft and Bethesda. Our course staff have strong connections with Eurogamer, BAFTA , Sony, Eidos, Ubisoft, Nintendo, and video game magazine publishing houses including Future and Imagine. The course has an annual guest lecture programme and we host numerous game industry conferences throughout the year. Each year we host the annual IGDA videogame writing panel and Game Camp. Roisi Proven, Supermassive Games Ltd.
Mark Morris and Chris Delay, Introversion. LSBU was shortlisted firstly in the category of best educational institution and secondly in the category of best education initiative & talent development. The latter nomination is for LSBU’s collaboration with specialist-technology charity Lifelites, which provides games and game hardware designed by LSBU students to terminally-ill children in hospices. The collaboration between LSBU and Lifelites is explained by GamesAid. AIM Awards is the specialist awarding organisation for the Games, Animation and VFX Industries, chosen by major employers to develop this innovative Level 3 Extended Diploma in partnership with them, to prepare students for high level degree courses and Apprenticeships. 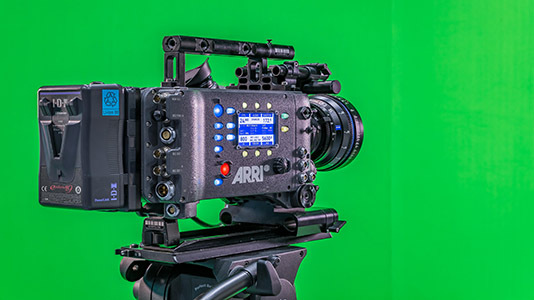 LSBU currently offers guaranteed interviews to any AIM Awards student wishing to apply for VisualEffects who has successfully passed level 3 or Level 3 equivalent exams. 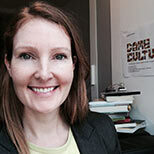 One of the top 30 Women in Games 2016, Siobhan Thomas is Course Director of the BA / BSc (Hons) Game Design and Development degree at LSBU. Siobhán is a game designer and writer specialising in augmented reality and pervasive learning games. A dedicated Games studio, motion capture studio, green screen, sound studio, photography studio, specialist library resources. Cubase, Logic, Sound Forge, Audacity, Audition and FMod. 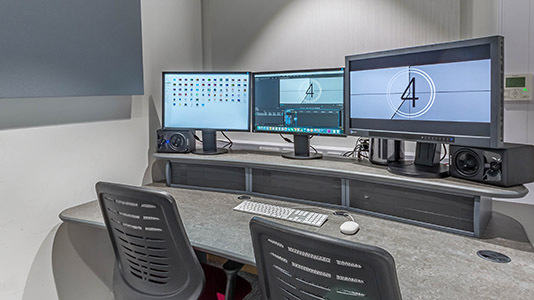 Seven Editing Suites, all air-conditioned and acoustically treated, are ideal for use in film and sound editing. All suites are networked with ultra-fast 10Gb/s network, making it possible to edit and grade, whilst sharing production files at speed. Your Lecturers are leading practitioners in their fields, so everything we do is industry relevant. Inspiring guest speakers from publishers, production houses and creative studios will give you further industry insight and build your professional connections. Your practical work will be supported by a team of Technical Demonstrators and you’ll have access to cutting-edge facilities. Our approach is grounded in the traditions of art and design, but informed by critical theories drawn from the established international field of Game Studies. You'll benefit from dedicated one-to-one guidance by our experienced lecturers who are active in Game Studies research. As a result, you'll have access to a substantial body of cutting-edge research that will help foster your own practical and intellectual development. You will have appointments with personal tutor at least once a semester for 30 minutes throughout your course. You can contact your tutor for additional meetings or support by email. Ary reflects on his 7 year career in the games industry; now Technical Designer at Sony, he's developed some of the world’s most popular video games. 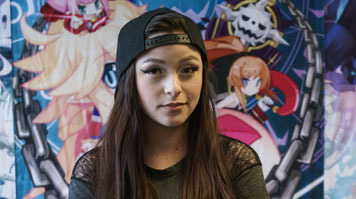 A keen fan of video games from an early age, Melissa has found that studying the gaming industry at LSBU has helped her follow the perfect career path. 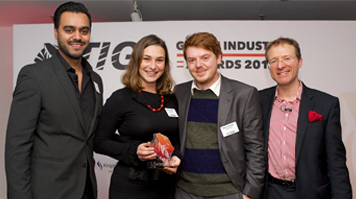 BA (Hons) Games Design graduate and gaming entrepreneur Roberta Saliani won a top award in recognition of her new gaming company Just a Pixel. 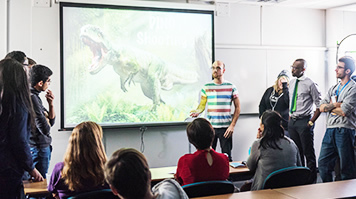 Ben Sharples supplemented his existing experience in the video game industry with the BA (Hons) Game Cultures. Chandler, H. (2009). The game production handbook (2nd ed.). Hingham Mass. : Infinity Science Press. Salen, K.; Zimmerman, E. (2004). Rules of play : game design fundamentals: Cambridge, Mass. : MIT Press.